The Star Florida Villa is located in 'The Retreat at Legacy Park', a new (2004/5) community of upscale, executive homes - situated in a natural setting just 2 miles South of the 192 on the Western side of Highway 27. With wide boulevards, and spacious, oversized lots, the Star Florida Villa in Legacy Park offers relaxed vacations to our guests, in a fabulous vacation home. Legacy Park offers easy access to the attractions and parks of Central Florida, Disney World is only 7 miles away (approx 10-12 min drive), we will also supply you with a short cut route. 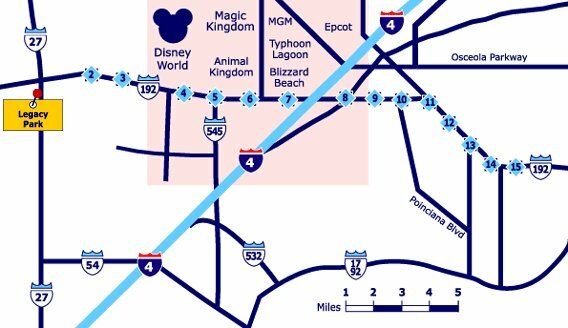 With fast roads from the Star Florida Villa at Legacy Park to many other attractions such as Universal, SeaWorld, Wet & Wild and Gatorland, this means they can all be reached within a short drive, (20-30 min). Dining out when staying at the Star Florida Villa in Legacy Park couldn't be easier, with some of the best-known restaurants and chains (and some private gems!) just literally a few minutes drive away. Within a 2 minutes drive from the Star Florida Villa there is a popular Applebys restaurant, a bistro restaurant, Sports Bar, Indian Restaurant, Ihop, Chinese Takeaway, Pizza Restaurant/takeaway, Fish & Chips takeaway, a Publix Supermarket, swimming pool shop, UPS store offering full postal service, realtor shops, bank/ATM and several shops offering internet access. A 24hr Super Walmart is located a 5 mins drive, along with various other restaurants along the US27 and even more on the 192, you will be spoilt for choice! Numerous golf courses are situated around the close vicinity of the Star Florida Villa, the closest being a 3 minute drive away and many more only 5 - 10 mins further. To get to Legacy Park, follow Highway 192 West until it reaches I-27 South. Follow I-27 South for 2 miles until you reach the entrance (on your right). We will forward you more detailed directions with booking packs. Renting the Star Florida Villa offers the best of both worlds, with beauty and convenience near the excitement of Orlando in Florida, yet far enough away to relax in peace and quiet.